In the era of Donald Trump, many lower- and middle-class white Americans are drawn to politicians who pledge to make their lives great again. But as Dying of Whiteness shows, the policies that result actually place white Americans at ever-greater risk of sickness and death. Physician Jonathan M. Metzl's quest to understand the health implications of "backlash governance" leads him across America's heartland. Interviewing a range of everyday Americans, he examines how racial resentment has fueled progun laws in Missouri, resistance to the Affordable Care Act in Tennessee, and cuts to schools and social services in Kansas. And he shows these policies' costs: increasing deaths by gun suicide, falling life expectancies, and rising dropout rates. 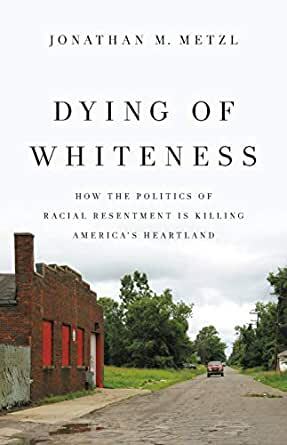 White Americans, Metzl argues, must reject the racial hierarchies that promise to aid them but in fact lead our nation to demise. Switch back and forth between reading the Kindle book and listening to the Audible narration. Add narration for a reduced price of $10.47 after you buy the Kindle book. I also have not yet read the book. But I want to counteract the one-Star review of another person who has NOT READ THE BOOK below. my impression of the author on Morning Joe this morning was the polar opposite: why DO people vote against their own interests. Why a person on his deathbed would STILL deny the validity of the ACA because he didn’t want ‘his tax dollars to help Mexicans and Welfare Queens. ‘ THAT is racial bias that Republicans have promoted! 125 people found this helpful. This book was a great read. The author help the reader gleam the heart of people who would rather harm there own existence then be humane to others. I live in the south. Mississippi had the opportunity to expand medicaid. My Republican party did not want to expand Medicaid. The medical industry is our largest employer. Most people on Medicaid are white and elderly, but most people think it is benefiting black people in the state. However, the rural white people would benefit the most. It would also bring more revenue and jobs to the state. It reminds me of the cult mentality, that caused the followers of Jim Jones to commit suicide, regardless of the red flags and facts. This book opened my eyes. You can not change hate, unless the individual wants to be reasonable. Some people are their own worse enemy. It is sad that they are willing to die in ignorance and hate rather than change. We hurt ourselves when we blame our problems on people who do not look like us. 5.0 out of 5 starsWHY DO PEOPLE VOTE AGAINST THEIR OWN INTERESTS? I've been struggling to answer this question for years and was hoping that HILLBILLY ELEGY would at least begin to answer that question and help me understand. It didn't. In contrast, I'm happy to say that Dr. Metzl writes a searing, intelligent analysis which encompasses a wide psychological and sociological grasp of people, places, politics, and positions. Highly readable, I felt that finally someone gets it and helped me get it! Although I saw the author on television in the same interview many reviewers allude to, I'm particularly alarmed that someone reviewed this book without having read it. Bizarre, but these are the times we're living in -- the age of being proud of one's own ignorance. Thus, a major point of the book is highlighted. 75 people found this helpful. 4.0 out of 5 starsThe Tennessee description rings true. I saw an interview this morning and immediately purchased and downloaded for Kindle. I finished it several hours later. As a citizen of Tennessee, I found his insights on the failure of Tennessee to expand Medicaid to be on target. I am looking forward to others I know reading the book, so we can discuss it. While the first chapter sets the context, it may seem very academic. Depending on your learning style, some people may prefer starting at chapter two and then coming back to read chapter one later. 5.0 out of 5 starsHas the America-Centric fantasy of race finally come full circle? Perhaps this is the only way to speak openly about race in America: as a glancing blow at those who have relied on racism throughout American history — first as an existential necessity, and now as an existential last resort. The author is talking about people who still hold out visions of continuing to trade on their lack of melatonin, and who have supposed that this same lack spells race superiority? They do this at the expense of their equally-suffering fellow citizens who just happen to come ready-packaged in a darker outer wrapper. Here, the author shows how this America-centric fantasy has come to an abrupt and ignominious halt: It has boomeranged back onto those very fantasizing people. While they buy the pre-cooked racist pie-in-the-sky — the red meat rhetoric of rich politicians, who are merely trying to hold their place at the top of the economic Ponzi scheme — they fall like a rock tossed into the Mississippi. Sadly, they are so economically and emotionally rattled and incompetent, they refuse to take the time to notice that when everyone is falling down the elevator shaft at the same rate, white skin no longer holds its value. As quiet as it is kept, this author tells us that whiteness has lost all of its meaning. And most of all, cannot save those who depend on it from their own culturally-inbred self-perpetuated ignorant fantasies. They hug the flag, and then shoot themselves in the foot economically with “Trumpy bear-like” patriotic fervor. The soberest part of this book is to realize that the “real data” is telling us something we already knew: That we have all been had! Careless, greedy, unpatriotic, mean-spirited, corrupt and sometimes even out right venal politicians on both sides of the political divide have found the need to use wedge and “reality TV” politics to drive a stake into the heart of all striving working-class people. The author says that Trump played Hilary’s “basket of deplorables” like a cheap bass fiddle. And why not? They were waiting to be had. And now, the democrats are triangulating so that in 2020 they can do the same? They want to end identity politics so that they can get to the only identity that used to matter, white identity. But we have become accustom to the fact that the political classes lie out of both sides of their mouths at the same time, as they stand in a circular firing squad pretending to point their guns at each other. But we know who their real targets are: us, all working class people. And when they shoot, they do so without any regard for color whatsoever. Miraculously, when the smoke clears from their point-blank firing circle, somehow, they never manage to kill off anyone within their own circle? No matter how devastating are the crimes they commit, none of them ever get prosecuted or ever go to jail? They all always get a pass? They alway protect their own. But when the firing stops, the economy has somehow melted, and the pharmaceutical companies have replaced the Cali cartel as drug pushers of first resort, and the life-span of the ducks on the ground beneath them somehow has diminished dramatically? Obama-Biden; Hillary-Kaine, Warren-O’Rouke, or Trump-Pence: roll the dice and they all come up craps! Could there be a better wake up call? As the opioid crisis sweeping across the heartland shows, the fall has been most dramatic by those who elect the Confederate-leaning Republican politicians, politicians who have never seen an American citizen they would not first fleece and then shoot in the back of the head, with a gun co-signed by the NRA.